Not a particularly busy auction week, but much to look at if posters or comics are of interest! On August 1, Swann Galleries sells Vintage Posters, in 608 lots. A group of four Art Nouveau decorative panels by Alphonse Mucha, representing the times of the day, rates the top estimate at $40,000-60,000. 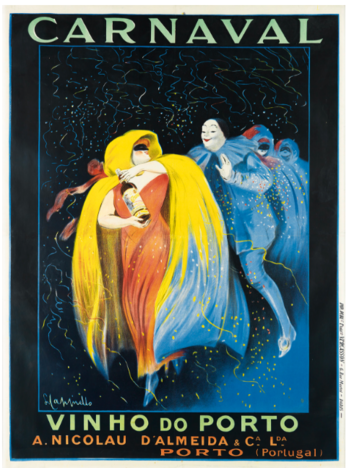 Leoneto Cappiello’s 1911 Carnaval poster (pictured) could fetch $20,000-30,000, while a 30 x 20-inch copy of the (now) iconic “Keep Calm and Carry On” poster from 1939 is estimated at $12,000-18,000. Heritage Auctions holds a Comics, Comic Art & Animation Art Signature Sale in Dallas, August 2-4, with a whopping 4,675 items offered. Expected highlights include an original 1972 Frank Frazetta painting which was used for a 1974 reissue of Edgar Rice Burroughs’ Escape on Venus (with a reserve of $500,000); a copy of The Incredible Hulk #1 (Marvel, 1962); and original cover art for Amazing Spider Man #55 (Marvel, 1967). On August 1, Swann Galleries sells Vintage Posters, in 608 lots. A group of four Art Nouveau decorative panels by Alphonse Mucha, representing the times of the day, rates the top estimate at $40,000-60,000. Leoneto Cappiello's 1911 Carnaval poster (pictured) could fetch $20,000-30,000, while a 30 x 20-inch copy of the (now) iconic "Keep Calm and Carry On" poster from 1939 is estimated at $12,000-18,000. Heritage Auctions holds a Comics, Comic Art & Animation Art Signature Sale in Dallas, August 2-4, with a whopping 4,675 items offered. Expected highlights include an original 1972 Frank Frazetta painting which was used for a 1974 reissue of Edgar Rice Burroughs' Escape on Venus (with a reserve of $500,000); a copy of The Incredible Hulk #1 (Marvel, 1962); and original cover art for Amazing Spider Man #55 (Marvel, 1967).